In a curious development, the source code of Snapchat was posted on GitHub by a hacker who claims to be from Pakistan. 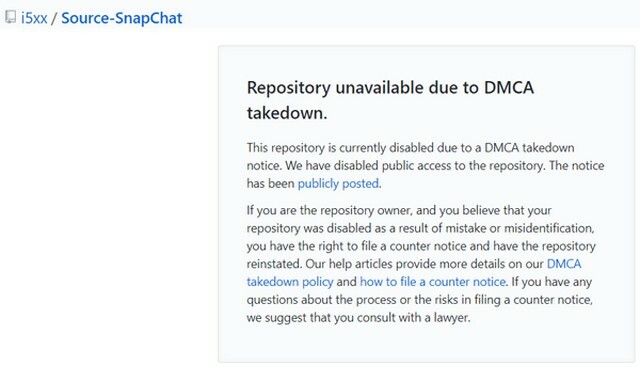 The leaked code is believed to be for the iOS version of the app, and has since been taken down by the Microsoft-owned site after being served with a DMCA takedown notice by a representative of Snap Inc. In accordance with prevailing practice, the site will not restore the files unless a valid counter-claim is filed by the uploader. As can be seen below, the listing page currently displays a notice that says ‘Repository unavailable due to DMCA takedown’. According to reports, the contentious repo was originally titled ‘Source-SnapChat’, and posted on GitHub by an user identified as ‘i5xx’, who claimed that the code was originally leaked somewhere else. It is believed that i5xx never identified the source of the leak, and investigations are currently on to unearth the exact details surrounding what’s being described as one of the biggest breaches of copyrighted software since a core component of the iOS source code was leaked online earlier this year. While Snap is yet to issue an official response to the media about the development, a cybersecurity researcher quoted by NewsWeek seems to be of the opinion that the Snapchat code could have been part of the app itself. They also seemed to suggest that the 21 thousand lines of code found on the GitHub repo very likely represents a small part of the Snapchat codebase. Not much is known about the alleged hacker at the moment, but according to NewsWeek, his Twitter handle is @i5aaaald, and initial investigations have apparently revealed that he might be from a small town called Tando Bago in the Badin District of Sindh province in Pakistan. The situation is currently still developing, so we’ll hopefully get more info on this subject in the days to come.